Why bundle tech demos when it can be a whole game? Made exclusively for VR, the platformer Lucky's Tale will come packaged with every Oculus Rift. 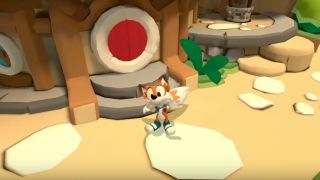 Developed by Playful, Lucky's Tale dives players into a colorful cartoon world as the eponymous fox Lucky. "We always believed there was an opportunity for platformers in VR," said Oculus CEO Palmer Luckey (no relation) in an official blog post. "It wasn't until playing Lucky's Tale and working with the Playful team that we truly realized its potential to change how people view this genre of gaming." Lucky's Tale won't be the only game to come with the Rift. Preorders of Oculus' headset will also include a copy of the spaceship dogfighting game EVE: Valkryie. Luckey has stated that preorder details for the Rift will be announced shortly after the new year and is still on track for release in Q1 of 2016. Fingers crossed that there will be more news to come during CES! Will Oculus make the big announcement next week? Follow our CES hub to stay in the loop!